I had seen these at multiple Target stores on many different occasions. I'm not sure why I never tried them up until now. It might have been the $5.99 price tag or the fact that I've never been thoroughly wowed by pre-packaged grocery store cheesecake before. There was just something that always scared me away. 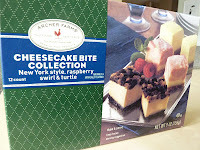 But I've made it through a good many of Target's desserts and reviewed them all here on this blog. 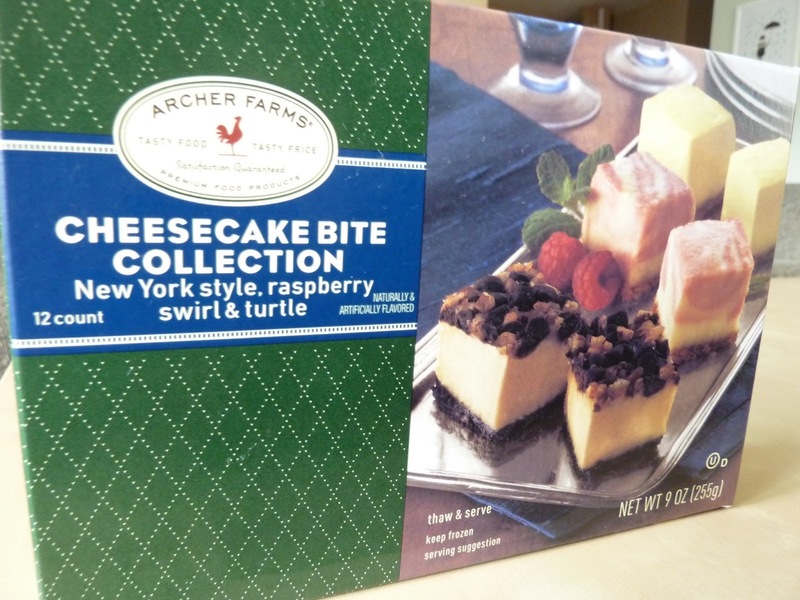 So it was only a matter of time until I broke down, splurged, and bought this pack of what turned out to be a variety of really amazing cheesecakes. Each of these flavors was excellent. However, my wife and I both agree that raspberry swirl was best. I thought the New York style was a very close second, but Sonia liked the turtle a little better. I thawed them according to the directions. I assumed they would be a little harder and colder in the middle, but miraculously, they were evenly thawed the whole way through. Everything from the crust to the creamy cheesecake was incredible. Both taste and texture were just about perfect. I'd call these things restaurant-quality. 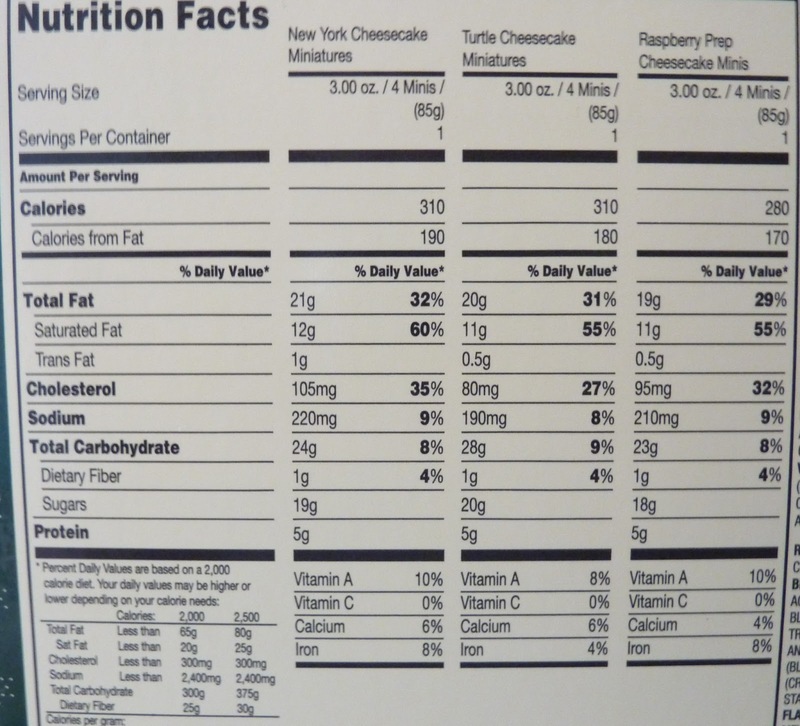 And not like day-old cheesecake from a dumpy diner quality...like pretty close to Cheesecake Factory quality. 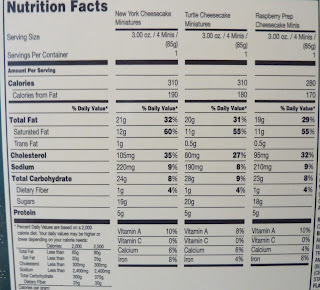 If I wanted to nitpick, I could dock some points for fat content, but hey, it's cheesecake. It's not supposed to be good for you, it's just supposed to taste really good. And it does. I would seriously consider serving these at a fancy shindig, or even a wedding. And finally, I think it's time to give out my first perfect score. Excellent choice - I haven't had the Archer Farms version (which appear identical to the miniatures sold under other names), but I know who their supplier is. Quality US maker that indeed also supplies restaurants. I wasn't aware of the identical miniatures under other brand names, but I know that's a common practice for store brands like Archer Farms. Good to know they are actually restaurant quality!